The Leo Tolstoy train connecting Moscow, St. Petersburg and Helsinki has got its own library featuring books by Finnish and Russian writers, both classic and modern ones. The books available at the library are cross-translated (Finnish ones into Russian and vice versa) to serve the tastes of both biggest categories of passengers. 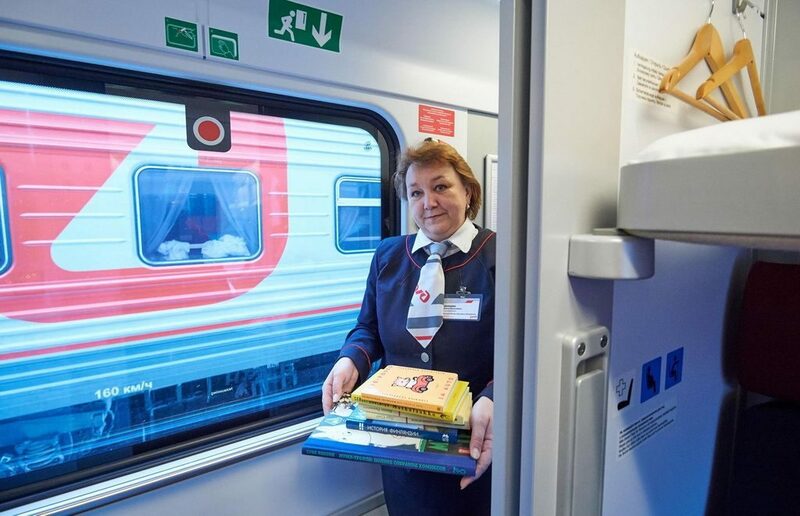 The library project organized by the Finland’s embassy in Moscow and the Federal Passenger Company (a subsidiary of Russian Railways in charge of domestic long-distance and international railway passenger transportation) has started on February 5 and will last till April 5. The library is not that big as you may think, it only takes just one shelf in an attendant’s department. For getting a book, the passenger must fill in an application just like at any library in Russia. 15 books are available at the train, among them are those of Tuve Jansson (of course), Siri Kolu, Aleksis Kivi, Mikko Rimminen, Salla Simukka, Lyudmila Ulitskaya, Vladimir Sorokin, Viktor Pelevin, Sergei Dovlatov, Andrei Astvatsaturov. We don’t know if there are books by Leo Tolstoy, but if not it would be a very funny joke especially given the presence of Alexander Raichsthein, a much lesser known Russian writer. As FPC’s representative said at the opening ceremony, should the project prove to be successful other trains may get their libraries too. With all our best wishes for this startup, we have some doubts regarding its popularity among passengers of the renovated highly comfortable train with access to Wi-Fi on board and about 150 movies available for rather low price and other amenities consuming the time of your just 14,5 hour journey. Leo Tolstoy train first departured to Helsinki on 30 May 1975. It daily starts at night from Moscow, early in the morning it stops at Ladozhsky railway station in St. Petersburg and just in a few hours arrives at the central railway station of Helsinki getting you directly to the flavour of the best coffee in the world (Paulig, of course) and the strict and cold environment of the Northern modern architecture. On the return way, it starts in the evening and stops a bit after midnight in St. Petersburg and arrives in Moscow in the morning. During the Soviet times, it was a great luck to get tickets from Leningrad to Moscow on this train with its export-oriented services and luxury interior. Interesting fact: when the Finland’s first diplomacy mission arrived in Moscow in January 1921, they had to live first in a railway carriage, and only some time later moved into a building, which happened on the 5th of February, the day the library project started 96 years later. If you happen to travel on Leo Tolstoy then take a photo with a book while on board, put it into Instagram, have it tagged #finruslitonboard and get a chance to win a book from the Finnish embassy. Which Russian author on board would we recommend? Start with Dovlatov and continue with Pelevin, they are definitely worth your attention. Let alone Leo Tolstoy even in case he’s absent.